I've switched most of my squashes to the miniature ones. I don't mean the vegetables called squash I mean orange cordials etc. The big bottles take up space, and the smaller ones are great even for travel. Funnily enough the bottles that sat next to my bottles of squash are my coffee syrups. They are big glass bottles, and I have various flavours from gingerbread through to chocolate chip cookie. 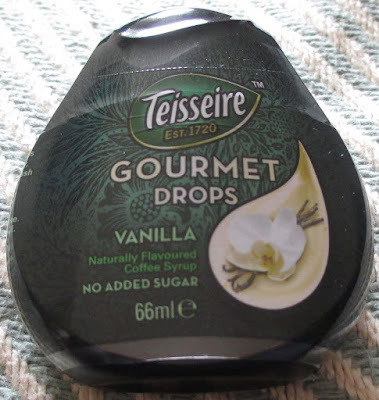 I was quite pleased to find that someone had miniaturised my coffee syrups into these ultra concentrate bottles. I didn't notice at the time but this one is also sugar free, which is a bonus. I made myself a latte and added a squirt of the gourmet drops. I stirred it all up and gave the drink a sip, wow it was sweet. I mean too sweet, it had a very strong sweet flavour, which almost over powered the coffee. The vanilla was all a bit lost in the overpowering sweetness. I mentioned it was sweet right? Ok, my fault, I thought I was pretty convinced I had just over squirted, it could happen to anyone. So the next day I made myself a latte and tried again. This time I cautiously added the smallest squirt I could, and tried my drink. It was still too much, it was much better and the vanilla was much nicer, but ultimately it still felt like I had added to much syrup to my drink, albeit not as bad as before. I didn’t think I could have added less, and my lattes are in a fairly big mug so it left me stuck. Sadly this particular syrup isn’t going to work for me, maybe my sweet tooth just isn’t sweet enough.